How does your team stack up in new MLB Relevance Rankings? If there’s one thing baseball has in spades, it’s history. Few sports can conjure up as much American nostalgia as the nation’s pastime or boast records with enough detail for a modern fan to reconstruct games before their father’s (or grandfather’s) time. With those deep roots come powerful emotional attachments for fans, whether in the form of passion for a team that runs in their family or disdain for a local rival. But when it comes to maintaining that relevance in fans’ lives, love and hate are one and the same. 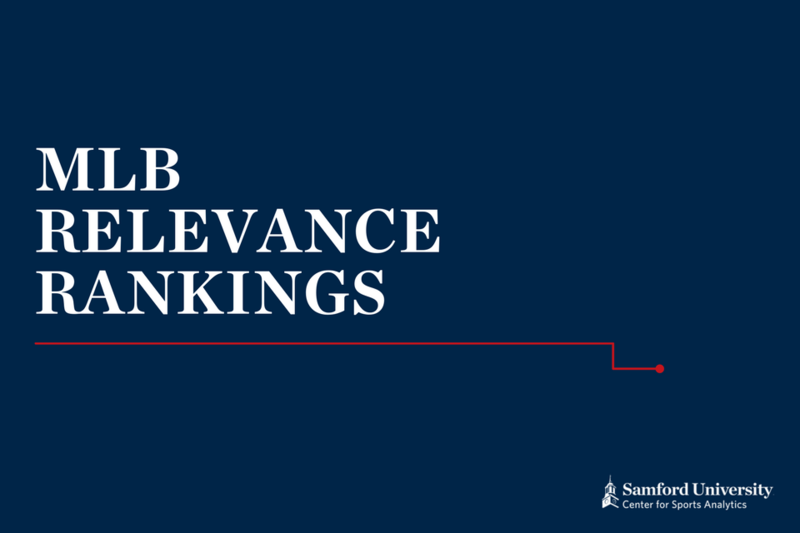 It should come as no surprise, then, that the 2018 MLB Relevance Rankings released by Samford University’s Center for Sports Analytics see the New York Yankees sitting pretty at number one. The Chicago Cubs, Boston Red Sox, and L.A. Dodgers fill out the top four, all teams that joined the Pinstripers in the top five of FiveThirtyEight’s survey of most hated baseball teams last year. Developed in partnership with Canadian consumer insights company Affinio, the Relevance Rankings draw on social media data from over 7 million U.S. sports fans. Based on fan connections with teams, sports brands, events, athletes, and sports reporters, each MLB team was given a relevance score between 0 and 10 that reflects its significance to U.S. sports fans. While longstanding teams predictably top the rankings, the bottom is rounded out by relative newcomers. The Miami Marlins, San Diego Padres, Toronto Blue Jays, and Milwaukee Brewers all registered scores of 1.6 or less. The Minnesota Twins are the only team in the bottom five with more than 50 years of history in the league. In fact, teams that have been in the league for 25 years or less — the Colorado Rockies, Arizona Diamondbacks, Tampa Bay Rays and Miami Marlins — struggle to even reach the middle of the pack when it comes to relevance. The Rockies scored the highest among those teams at 2.1, leaving them just outside the top 20. Where teams are located appears to have nearly as much say in fan engagement as pedigree. The northeast and midwest, home to MLB teams as far back as the 19th century, lay claim to more than half the teams in the league, with only the Twins and Brewers falling below a 2.0 relevance score. The west coast is a different story. While the Los Angeles Dodgers, San Francisco Giants and Los Angeles Angels all hold their own in the top half of the rankings, the Seattle Mariners, Oakland A’s, Arizona Diamondbacks and San Diego Padres all languish near the bottom with scores of less than 2.0. In the south, the Texas Rangers have an edge over the Houston Astros, despite the Astros winning it all last year. The Rangers would be wise to keep looking over their shoulder, though. The 2012 hire of a literal rocket scientist to act as the Astros’ director of decision sciences was only the beginning of an analytics revolution that looks likely to serve them well for years to come. Meanwhile, the Atlanta Braves sit directly between the two Texas teams with a relevance score of 3.6. Their 6th-place rank is impressive for a team in the midst of a rebuild that has seen four straight losing seasons, but seems unlikely to improve barring a breakout year. The past looms large in baseball, but the future is unwritten. While larger and more established fan bases will maintain a stable Relevance Ranking over time, standings are always subject to change based on a variety of factors, not least of which is performance. In Washington, D.C., a Nationals team energized by the return of Bryce Harper could rally the city of transplant fans to a higher profile than its underwhelming 20th-place rank. The Cardinals might ride a quietly reliable lineup of hitters to pressure their rival Cubs. Or a bounce back season for the Phillies could ignite their hometown fans to the levels of insanity we all know they’re capable of. Disappointed by your team’s ranking? Check back throughout the year to see how scores change as the season unfolds. Drew Woolley is a freelance writer in Huntsville, Alabama, who assists the Center for Sports Analytics.